I opened my eyes to find the bright morning sun shining on my face. Looking at the clock, I noticed it was still rather early, at least for me. "It's not even 8:00," I muttered aloud. "Why am I awake?" I sat up and realized my shades were pulled open, allowing the morning sun to illuminate my room. My owner must've come in and opened it before she went to bed. I knew that she wouldn't have me wake up early unless she had a reason, so I grudgingly got out of bed and began brushing my fur. I sighed as I watched the brush run through my plain yellow and brown fur in the mirror. For as long as I can remember, I've wanted to be painted. I wanted to be painted faerie. It was so much more beautiful and elegant than boring old yellow. The fact that I would have wings was an added bonus. Of course I'd never actually told my owner this, as I knew we couldn't afford it right now. I gave one last disappointed look at my average appearance before making my way downstairs. I entered the kitchen to find my two painted siblings and my owner Tiana murmuring amongst themselves. This aroused my suspicion. "What's going on?" I asked as I sat at the table. I noticed that there weren't any omelettes prepared, either. "We have a surprise for you, Sina!" my Gelert sister, Neraina, announced. "Really, why? What is it?" I couldn't imagine what was so big they wanted to give it to me today. "Well, Neraina and I know how much you want to be painted, and since you're the only one of us who isn't, all three of us have been saving to buy you a paint brush for the last several months!" my brother, Sor, explained. I was astonished. "How did you know?" I asked. Neraina shrugged. "I'm good at reading people. Plus, Sor read your diary," she added. I shot him a glare, and the fire Korbat quickly averted his gaze and changed the subject. "So do you want to be painted today?" he asked quickly. My expression softened. "Of course I do!" I exclaimed. "Great! Then let's go! And we'll eat breakfast in the Catacombs on the way back!" Tiana said. As we made our way to the Rainbow Pool, my head was filled with thoughts of soaring through the air, my beautiful teal wings and tail being admired by others who could only wish they could look like me. When we reached the pool, I was shocked as Tiana pulled out a brush nestled on a red pillow with blue and purple swirls. "A Royal Paint Brush..." I said quietly, my ears drooping in disappointment. "Of course, I just love Royal Girl Xweetoks! And can you believe I only paid one million for it? That's why I could afford it so soon!" Tiana squealed. "Um, that's great, Tiana, but... well, I was hoping it would be faerie," I admitted, hoping I wouldn't hurt her feelings. "Faerie? But I thought you liked Royal Xweetoks?" Neraina asked. Before I could ask her where she got that idea, I suddenly recalled a few months ago when I had admired a royal Xweetok I had seen at the Smoothie Shop with Neraina, and I had told her how great the color looked. "Well, Royal Boy Xweetoks. I don't think I've ever even seen a Royal Girl Xweetok," I replied after a moment. "I've always wanted to be faerie! Faerie Xweetoks are beautiful! Can't you just sell that paint brush and buy a Faerie Paint Brush instead?" I asked Tiana. "Oh, come on, Sina! You'll love being painted Royal! Besides, you always talk about how average and common yellow is. Faerie isn't much less common. There're hundreds of faerie Xweetoks everywhere you go. They're beautiful, sure, but there's just so many of them these days. Royal doesn't get nearly as much attention as it deserves," Neraina explained. "It's not common! I don't see that many of them. Being faerie will make me much more unique than yellow ever could. It's my dream color. If Tiana really wants a royal Xweetok, can't she just adopt another pet?" I reasoned. My owner shook her head. "I can't afford to take care of a fourth pet right now, Sina. 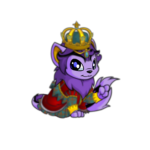 How about this: you spend the next few days travelling around Neopia Central and Faerieland, and tell me how many faerie Xweetoks you see, and if you still think it's an uncommon color. If you don't change your mind, I'll sell this paint brush and buy the faerie one, okay?" she suggested. I sighed reluctantly, but decided she probably wasn't giving me a choice. "Great! Let's start by going to the Coffee Cave," Tiana said. I slowly trailed my family to the Catacombs, keeping my eyes focused on the ground. After a while, I was getting bored so I looked up and glanced at all the pets around me. Out of all the Xweetoks I passed, faerie was definitely not a rare occurrence. It didn't seem outrageously common to me, though, and I kept my opinion set. After breakfast, I travelled with Neraina to Faerieland. The Gelert was just as determined to change my mind as our owner, and she would point out every faerie Xweetok that passed us by, regardless of whether I had spotted it or not. As we walked around Faerie City, I couldn't help but notice how right Tiana and Neraina were turning out to be. There were countless Xweetoks we passed in Faerieland. Many were basic colored, and other cheap paint brush colors, but for every three basics I saw, there was at least one faerie. They were right. "Okay, you were right. Faerie is extremely common after all," I admitted that evening on the ride home. Neraina beamed proudly at me, wagging her pink tail. She certainly loved being right. "I really wish it weren't so popular, though. I wanted a color that not only makes me beautiful, but that's unique and makes me stand out a little. If I paint myself faerie, I'll only be blending in with another crowd," I said to her sadly. "It's not a bad thing, Sina. Tiana hasn't sold the Royal Paint Brush yet. Why don't you give that color a try? You still don't even know what Royal Girl Xweetoks look like, do you?" she asked. I laughed a little. "No, I guess I don't." The very next morning, I happily went with my family to the Rainbow Pool, clutching the Royal Paint Brush in anticipation. "Go on, jump in!" Sor urged me. Smiling broadly, I stepped in, lifted the brush from the pillow, and dipped it in the water. It was a magical sensation, feeling the cool paint spread across my fur. I watched the brown fur on my paws change to a delicate lilac, and I could feel a robe and crown form on my body. When it was over, and the brush had dissolved into the water, I stepped out and looked at my owner and siblings for their reactions. Tiana's face lit up, and Neraina let out a squeal. Even Sor was grinning. "Oh Sina, you look amazing!" Neraina exclaimed, looking me up and down. "Go look in a mirror!" she added. I walked over to a full length mirror displayed on the other side of the pool and gasped at my reflection. It was even better than faerie! My fur was a beautiful shade of purple, my eyes a deep blue, and I was wearing a lovely red and green velvet dress. I also had a crown and dark purple hair. "It looks incredible," I said, smiling. "See? I told you this is so much better. You'll definitely stand out now!" Neraina assured me. And it was true. I finally have a color to represent myself. I'm beautiful, I stand out. 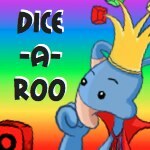 Dice-A-Roo # 4 - Oh No!! What happened to your neopoints pot?